Every Wednesday, Sindisa Baloyi, a 69-year-old grandmother of seven, has the opportunity to meet with other grannies from Alexandra to spend time singing, dancing, praying, reading the Bible or just having a good chat. 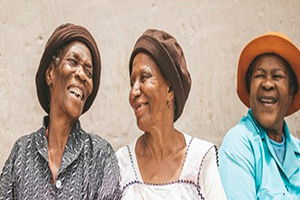 For the grannies of ‘Gogos of Hope’ (a Rays of Hope community initiative), it’s a space where they can share a cup of tea and a small bite to eat, while listening to each other’s daily struggles and making one another feel supported. With four children and seven grandchildren to care for – one of which has become her dependent – Sindisa, like so many other grannies in Alexandra, faces major hardships. Since joining the programme in 2015, she has not only made a lot of new friends among the grannies in her community who face similar challenges to hers, but has found a place that offers a much-needed break from her many responsibilities. The skills that the grannies learn during their weekly Gogos of Hope meetings help them to generate an income to help support their families, as many of the grannies sell the small items that they’ve sewed, knitted or crocheted. “Gogos need support because we have no one to depend on, and when we come together for these meetings every week, we get to share our problems and even help each other to find solutions,” says Sindisa. Help Sindisa and the many grannies of Alexandra through the Gogos of Hope programme. Donations of fabric, wool or beading items, secondhand sewing machines, as well as any food items like vegetables and sandwiches are welcome. You can also donate your time by empowering more grannies with sewing, knitting and crocheting skills to earn an income. Donate to the Gogos of Hope programme, here.